Viewing video one-on-one on your Kindle Fire HD is a great way to get your entertainment. The Kindle Fire HD Videos library may become your favorite destination for buying, viewing, and organizing your video content. When you tap Video on your Kindle Fire HD Home screen, the Amazon Videos Store opens. 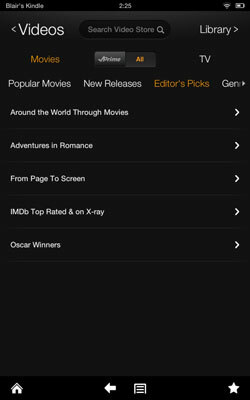 The Store shows several video categories in rows running down the screen such as Featured Videos, Prime Instant Videos, and Your Watchlist (Watchlist is a way to make note of items you may want to watch in the future; you can add any video to your Watchlist by tapping and holding it in the Store and then tapping Add to Watchlist in the menu that appears). Tap any video in the various lists to get more details about it. 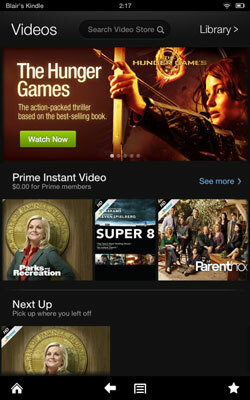 When you tap the Prime Instant Videos category, on the screen that appears, you can also use the tabs at the top of the screen to display just Movies, Prime, TV, or All Videos. There are also several tabs for narrowing your search such as Popular Movies, New Releases, Genres, or Editor’s Picks. The categories may change over time, but the basic process of locating a selection and displaying its details should stay the same. When you tap the All button in the Store, you see all items across categories organized by popularity. Tap the Library button to go to your Videos library. The library sports two tabs — one lists all your videos stored in the Cloud, and one includes videos you’ve purchased that you have downloaded to the device. The tab that has orange lettering is the active tab. 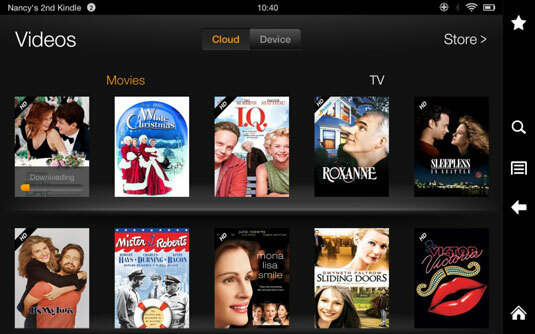 In addition to the Cloud and Device tabs, there are two tabs for filtering content by Movies or TV programs. You can tap the Search button in the Options bar (on the right side of the screen when the Kindle Fire HD is in landscape orientation) to search for a particular video. Tap the Menu button on the Options bar to display two items — Settings and Help & Feedback. In Settings you can view the Device ID and tap HD Download Options to access the Ask When Downloading setting. 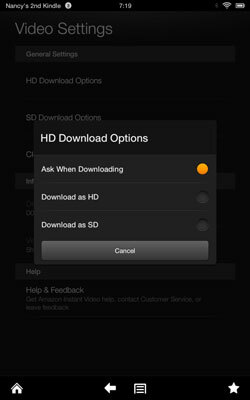 If you disable this, it turns off a feature that asks you first before downloading high-definition videos. Though it’s a good idea to be selective about downloading HD videos as they can take up a lot of memory, you may grow tired of seeing the message every time you download your new favorite flick. You can tap the Menu button in the Options bar and then tap Your Watchlist to view the videos you’ve set aside in a list for future viewing.